One spring trend for 2013 is all of the gorgeous shades of green. From mint, kelly green and rich emerald – I am green with envy over all of the options Kohl’s has to offer in these colors. Have you thought about mixing and matching different shades of green for a monochromatic look like no other? 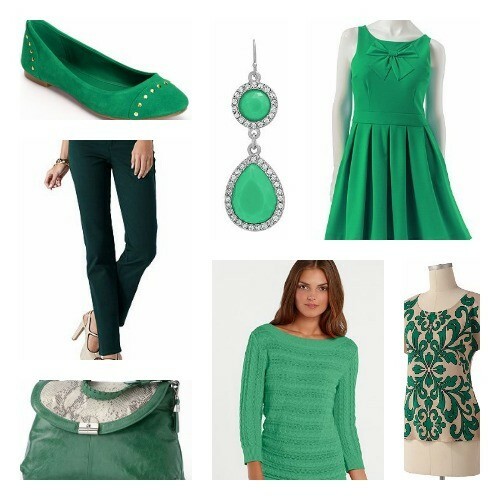 Or how about going for a color-block look by pairing together kelly and emerald green? You can also go with the no fail monochromatic look featuring one shade. I am picturing one very cute monochromatic mint outfit. Whether you are ready to kick it up a notch and create an outfit like nothing in your closet or you just want to add a green accessory to your spring wardrobe, Kohl’s has you covered.